If you’re a runner, you’ve probably had your fair share of aching foot pain. The good thing is that the pain barely lasts two days and, in most cases, it goes away naturally. But, what if you are preparing for an upcoming race and working through a training plan? The 26 bones, multiple joints and tens of muscle groups, ligaments and tendons in your feet support more weight than any other part of your anatomy. They are prone to impact-based disorders such as fasciitis, corns and calluses. Well, investing in a foot bath could work the wonders on your feet. 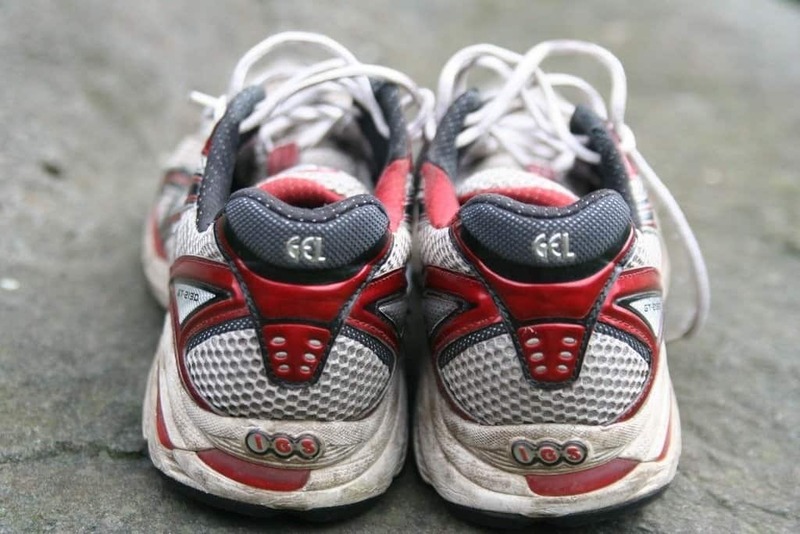 It will not only help you treat yourself to a measure of relaxation after running but help relieve foot pain. 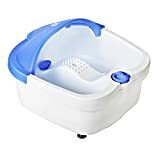 Below are the five best foot baths that I researched when I was purchasing one. As I was going through the process I jotted down all the features I liked and didn't. Hopefully you find these overviews helpful and you find one that fits your situation. Other cool features include a heating element that can heat water up to 115 degrees making it feel like a hot tub; a detachable pumice stone for treating dead dry skin cell on the bottom of your feet and heels, and a splashguard to ensure the water doesn’t splash out onto the floor. 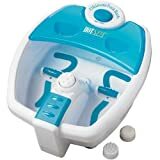 If you really want automatic rollers, this might not be the product for you , but if you can look past that, the Brookstone Aqua-Jet Footbath is a quality foot bath. This HotSpa made it to this list essentially due to how well it blends quality and affordability. It offers multiple settings to help soothe your feet. You can calibrate it to jet massage action, infrared therapy and bubble injection in combinations of your liking. You also get to choose how vigorous you want the massage and, accordingly, how long you will stay in the bath. From the aesthetics perspective, it comes with a set of stands to prevent the base from damaging the floor and a control panel that can be accessed even while you’re using the unit. From the way the buttons have been placed, you can actually use your toes to make adjustments. On the flipside, the product has no heater to keep the water warm, which makes it unsuitable for long massage sessions. Yes, it has an insulated body to minimize heat loss but that may not be the same as having a built-in heater. Also, there are no automatic rollers, meaning, you have to keep moving your feet against the nodes for a uniform massage. The Ozone foot bath is a tested-and-tried product when it comes to getting rid of soreness and feet pain on the bottom of your feet. It looks more like a breadmaker than a foot massager but this thing has a ton of great reviews. Integrating ozone benefits into hyperthermia healing therapy to relieve painful, sore feet and refresh meridians of body through its heated water in the calf-deep water container. Combined action of ozone therapy and heated water surfing and rolling massage to boost and increase uptake of oxygen and improve body circulation. Strong air bubble massage with waterfall or water jet surfing system, waterfall and water jet can work alone or simultaneously. Equipped with detachable herbal bag container, one extra mineral stone container included. It features multiple massaging bumps on the sides and automatic rollers at the bottom, which alleviate pain by increasing oxygen uptake and improving blood and ﻿ly﻿mph circulation. 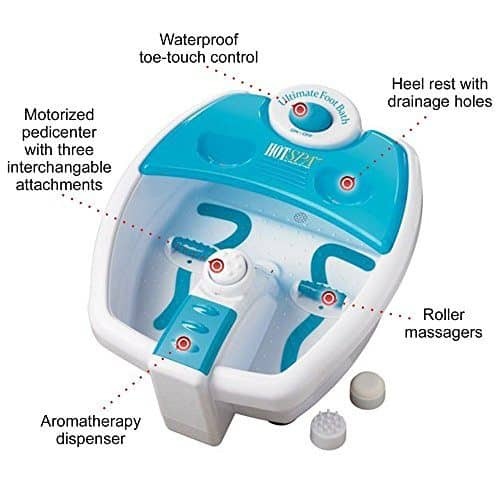 The air bubbles, which are an optional convenience, work together with the waterfall jet system to offer a soothing massage to the foot reflex areas. It can heat water up to 118 degrees, which is plausibly too much for the feet, but sports an adjustable heating element with which you can calibrate to your desired temperature. And just for the record, it uses the selections you make to automatically raise the temperatures when the setting is too low. One negative is the overall weight - this foot bath comes in a 20 lbs. I included the youtube video that shared some really good insight below. If we were to simply look at the manufacturer behind these amazing products, then the Pibbs foot bath would hands down come first. 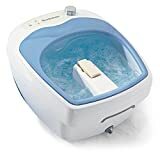 Pibbs Industries sits at the top of the pile when it comes to beauty, salon and spa equipment, and the Pibbs footbath is deserves the hype. The product has three effective modes that not so many of its rivals can boast: vibrate; heat and vibrate and heat – which you can comfortably toggle between even while you’re using it. It has a detachable splashguard and a heating element that not only heats the water but also keeps it at your desired temperature for a perfect and unaltered pain alleviation process. It can take up to 15 minutes to heat the water to 115 degrees (108 is the recommended temperature). It also, as an added bonus, gives you the option to use residual heat in bits to minimize on power usage, thanks in part to a well-placed and easy-to-use control panel. 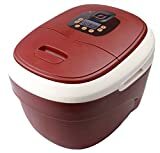 With high frequency (HF) vibration, oxygenated bubble massage, a red indicator light and infrared heat, no foot is too sore for this all-in-one foot bath. The product has been set in a way that not only works to alleviate pain sensations but also betters blood circulation, relieves fatigue, enhances metabolism and soothes the pressure joints in similar fashion as the traditional Chinese Qi philosophy. It uses the famed DuPont Positive Temperature Coefficient semiconductor heating element to heat the water in near-instant tempos. It also has a multi-insulation protection for overheating to counterbalance the spin-off effect of the rapid heating. Just like the Pibbs, it functions in three modes, vibration massage plus infrared heat, vibration massage plus bubbles and infrared. It is durable, thanks to its temperature and aging-resistant plastic body and has a set of wheels and a carry handle for convenience in moving around. Lack of automatic rollers may, however, come as a drawback for the otherwise perfect footbath. Identifying the perfect footbath in such a chockablock market may prove a grueling task for a single individual. And with everyone hyping their product so zealously, it’s almost impossible to make a sober decision. We have done the dirty work for you! The above list is a work of careful thought, and makes for the best money can buy regardless of the taxonomy criteria being used. You only need to set your priorities straight and, well, your feet ready because one of these products is sure to meet or even outdo your expectations.